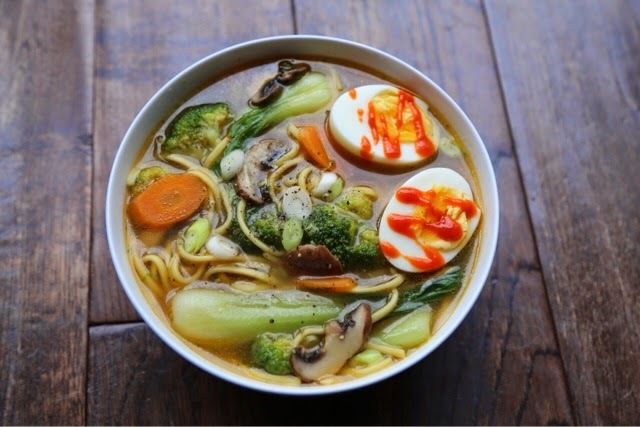 Ok so I've been requested a few times to divulge my recipe for the yummy ramen noodle soup I keep posting pics of on my fit food Instagram account @phyliciasfitfood so here it is! Super simple yet oh so delish! And you can totally make your own creations using whatever veggies or protein you desire. Pictured is spicy chicken broth with egg noodles, bok choy, carrot, broccoli, mushroom and hard boiled egg with sriracha! Bring the water to boil and drop in the stock pots. Stir to dissolve and add the hot sauce and black pepper. Now add all the veggies. If using dried noodles add those too and let simmer on medium for about 10 minutes or till noodles are cooked. If using soft already cooked noodles, add them for the last minute of cooking. Turn off heat and stir in the spring onions and sesame oil. Pour into bowls and serve with your choice of protein on top and hard boiled egg. Slurp and enjoy!